This ultra-slim AC from LG is a unique square wall unit that looks more like a wall art. It employs inverter technology and features a new three-way soft airflow, because of which the warm or cool air is distributed evenly to either of the sides and the floor as well. This provides a much pleasant and soothing effect than other AC’s that blasts a direct stream of air in a particular direction. 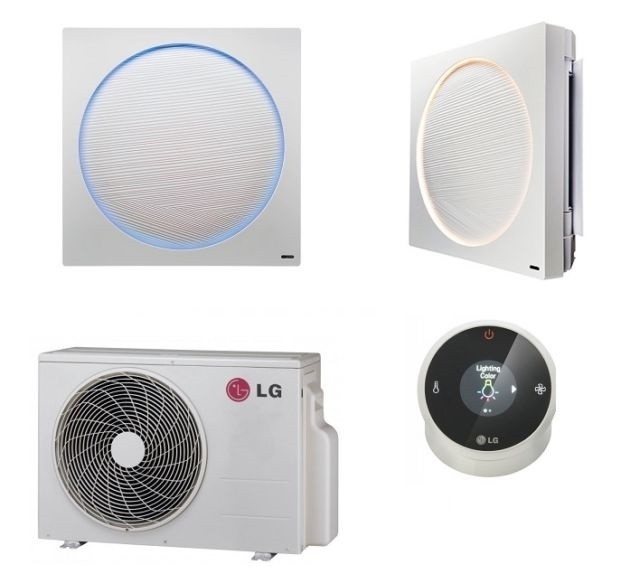 The subtle LED lighting not only add elegance to the unit, but also indicates whether the AC is presently cooling or heating a room by changing color. You will get an an equally attractive remote control that features a 3.4-inch touch screen display in a sleek, rounded design with the Artcool Stylist Inverter V. It includes advanced controller for adjusting the settings like the colour and brightness of the LED lighting. You can also see useful information such as operating mode, temperature and time on the display.